Evangelism: Going out and spreading the gospel or good news to those who are lost. 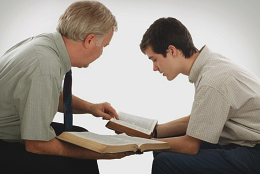 Edification: Building spirituality and good moral character through teaching. Benevolence: Genuine care, concern and compassion toward those who need assistance to sustain daily life (e.g. the hungry, sick, elderly, etc.). Worship: The church's complete devotion to God, whether formal (Worship Services) or informal (Daily Living). Each member of the congregation should seek to know and incorporate the church’s mission in his or her daily life. This statement should serve as a constant reminder of why we do what we do to the glory and honor or God! As we work to be all that Christ's spiritual body should be, we will strive to encourage, equip, and involve everyone in our family to more perfectly walk with God. Because God loves us, we seek to extend the same love, grace, and forgiveness to those around us with the intent of bringing them to the same salvation and blessings we enjoy in Him. To that end, we hold up Jesus Christ and Him crucified, the Lamb of God and the Light of the world. We believe it is important for us to be more than a "church". We strive to be a FAMILY! As a family we know each other in a way that will allow us to build up Faith, develop Hope, and express Love. We hope you will consider becoming a part of our family.